It's hard to believe that Tom Brady and Bill Belichick are ending their 13th season together. When the Patriots selected Brady with the 199th pick of the 2000 draft, no one could have imagined that he would develop as he did. But together, Brady and Belichick have helped the Patriots win three Super Bowl championships and put together one of the NFL's premier franchises. FOXBOROUGH, Mass. — Stump Bill Belichick? Tom Brady knows better than to try. The two meet several times during the week as the New England Patriots prepare for their next opponent, reviewing film, talking about game plans, trying to get better. Brady, the sixth-round draft pick who has developed into a Hall of Fame quarterback under Belichick, doesn’t even try to come up with something Belichick hasn’t seen before, or heard. 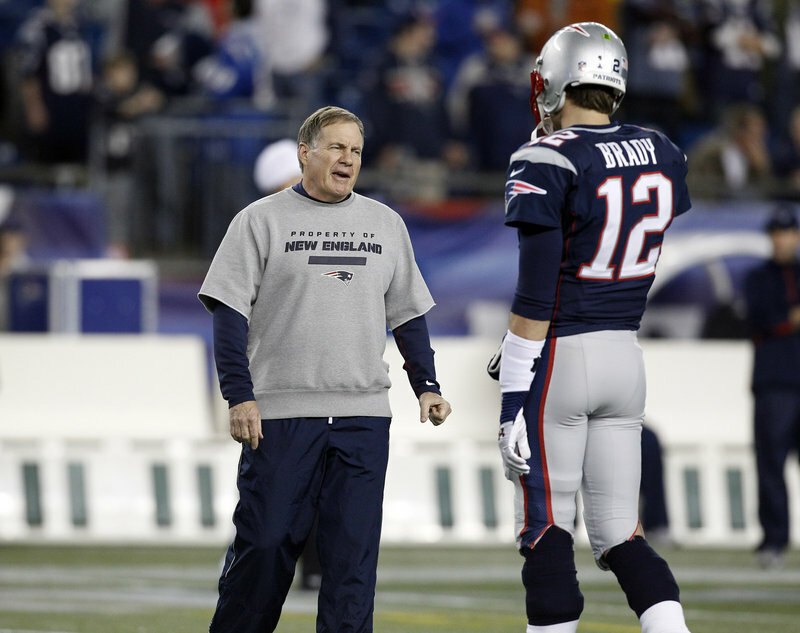 It’s hard to believe that Brady and Belichick are ending their 13th season together. When the Patriots selected Brady with the 199th pick of the 2000 draft, no one could have imagined that he would develop as he did. But together, Brady and Belichick have helped the Patriots win three Super Bowl championships and put together one of the NFL’s premier franchises. Entering Sunday’s regular-season finale against the Miami Dolphins at Gillette Stadium, the two have a record of 134-39 — the best regular-season record in NFL history for a coach-quarterback tandem. Don Shula and Dan Marino combined for a 116-68 record, Terry Bradshaw and Chuck Noll 107-51. Teammates often talk about their competitiveness, their quest for perfection, the countless hours they spend pouring over game film to detect even the tiniest advantage. Asked earlier in the year about the Patriots ability to cause fumbles, Belichick said the Patriots watch how opposing backs carry the ball. It’s that type of attention to detail that has pushed the Patriots — and their coach/quarterback duo — to the top. New players come in knowing they have to perform simply because the standard is set so high by Brady and Belichick, a fact alluded to earlier this year by veteran wide receiver Brandson Lloyd. The Patriots usually do quite well. They have had a winning record in 12 consecutive years, second only to the great Tom Landry-led Dallas Cowboys teams that had 16 straight winning seasons from 1970-85. They’ve had 10 consecutive seasons of at least 10 wins, second only to San Francisco’s 16. And at the forefront is Brady and Belichick. An average passer when he first took over for Drew Bledsoe in 2001, Brady is now one of only five quarterbacks in NFL history to throw 30-or-more touchdown passes in at least four seasons, as well as one of only five to have at least 4,000 passing yards in at least five seasons. Belichick has 203 career victories, including playoffs, 166 with the Patriots. Belichick, of course, tries to steer away from singling out any one player. He reminds everyone that the Patriots won 11 games in 2008, when Brady suffered a season-ending knee injury in the first game. But he admits having the same starting quarterback for 11 of the last 12 seasons has been extremely beneficial. How many other teams can say that? None. All you have to do is look at the circus that has been the New York Jets this year, or the Arizona Cardinals, or Philadelphia Eagles, to know that quarterback stability is a fragile reality in the NFL these days. Belichick has been asked several times how Brady, at 35, has remained so productive. He has thrown for 4,543 yards with 32 touchdowns and only eight interceptions in helping the Patriots to an 11-4 record. And Brady, ever the student, keeps asking Belichick how to get better. “You can never stop learning in this game and can never stop improving,” Brady said. “He’s been at it for a lot longer than I have and I’m sure he feels like he’s still improving as a coach and I’d agree. The things we talk about, the things that we’re trying to accomplish, those change.